Before I even begin this post, I’m going to admit something: it’s a little ironic. While I’m writing this, I can’t breathe through my nostrils, I’m surrounded by tissues and my head feels like its going to explode. 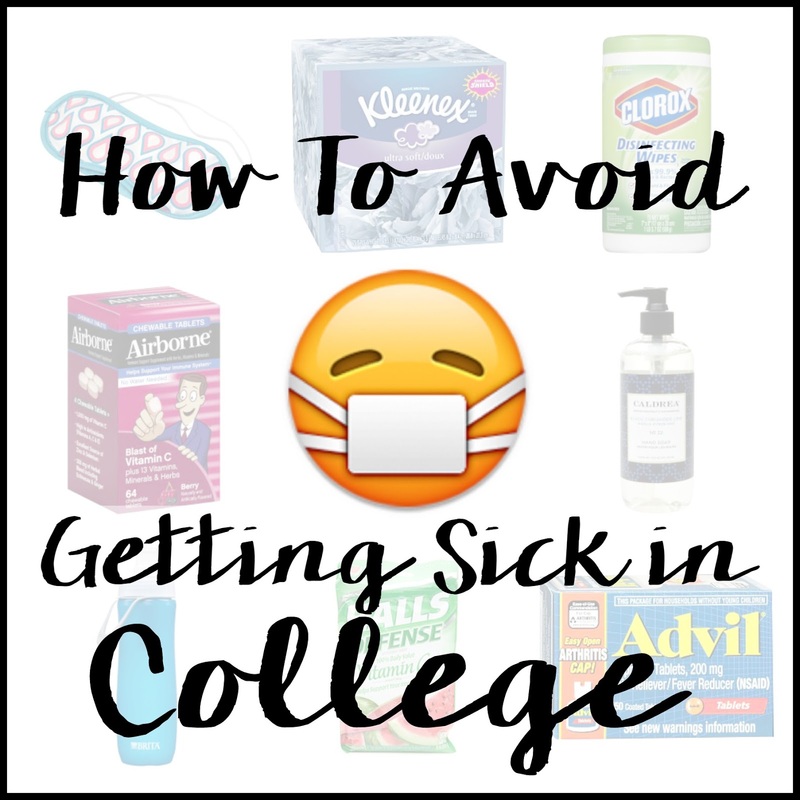 But here I am, about to tell you how to avoid getting sick in college. Ha. Listen to me or not? But hey I survived at least one year so far, so I have a little knowledge at least! First of all, wash your hands. I know, I know, I sound like your mom. But in college, everyone is in close quarters with everyone. Imagine how many people in the same chair as you each day, or use the same door handle, or even the same stair rail. That’s a lot of germs. During this time of the year, everyone is getting sick, and because no one’s mommies are here to take proper care of us, there’s a high chance that sickness is getting spread like rapid fire. The best thing to do is to wash your hands frequently and obsessively. Next, make sure you keep your room/apartment clean. Wipe down counters, doorknobs, tables, everything with Clorox wipes to avoid spreading sickness between roommates or guests. As for yourself, H2O is your friend. Keep a reusable water bottle on you at all times and frequently fill it up. This is generally a good thing to do all year round but especially during this time of the year. Another great thing to do is take Airborne. Although its primarily marketed to take for airport rides, Airborne is full of great vitamins to keep your immune system in tact. I hate the kind that dissolves in water, so I opt for the chewable kind. It’s not horrible tasting and it’s so good for you. Get some sleep. I’m a big advocate for lots of sleep. Mainly because I have a really comfy bed. But like most college students, I realize getting at least eight hours of sleep each night is a lot to ask for, especially around finals time. But if at all possible, turn off the Netflix, put away the laptop and get some shut eye. Your immune system will thank you. Eat well. Okay this is definitely one I struggle with. It’s so easy to eat fried, sugary or fat foods, especially when you’re living in the library or only have a small amount of time for a meal, but try to opt for salads, fruits and vegetables whenever you can so that your body can build up, rather than break down. Exercise. Another one I struggle with, especially this year. (Is the Sophomore 15 a thing?) But exercising in general keeps your body healthy, so there’s no point not to! Mom yourself. Remember when you lived at home and got sick, your mom would shove a million different medicines in your face, asking what your symptoms were? Do that to yourself. Go to the pharmacy, the health center, the grocery store, whatever, and buy yourself some medicine. You need to keep yourself healthy, and sometimes you just need medicine to make that happen. Well, wish me luck in following my own advice. Until then, I’ll be that girl sniffling in class and blowing her nose in toilet paper because college doesn’t know tissues are a thing, apparently.